Domino’s, the renowned pizza delivery company, continued in their efforts to give back and connect with the community, by sponsoring local football team Fgura United. This club is a successful football team based in Fgura which was established in 1971 and which currently plays in the Maltese First Division. This partnership brokered by Famalco Group, will see the Domino’s logo printed on the front of the club’s official gear as well as their nursery training kit. Even though the Group’s motto is ‘Building Businesses’, the local company is also keen on investing in local talent and associations, always keeping Malta’s success at the forefront. In fact, Famalco group’s Co-Founder and Director Hermann Mallia states that “both Famalco and Domino’s are thrilled to be able to sponsor Fgura United. Sport is a passion of ours, and helping a local team in their efforts gives us great satisfaction”. 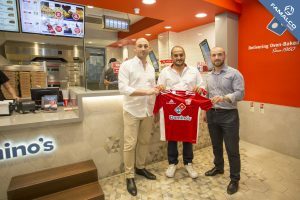 When the sponsorship was given, employees of Famalco Group escorted one of Fgura United representatives to the Domino’s store in Birkirkara, were they happily posed for a picture with the new kit. Through this investment the company hopes that both the nursery and full team can thrive even further, and continue to encourage and train young children to play their favourite sport. Therefore, with Domino’s sponsorship of Fgura United, Famalco hopes to help the club thrive by maintaining their local accomplishments in football, while also connecting with the community they serve through the thrilling game of football.